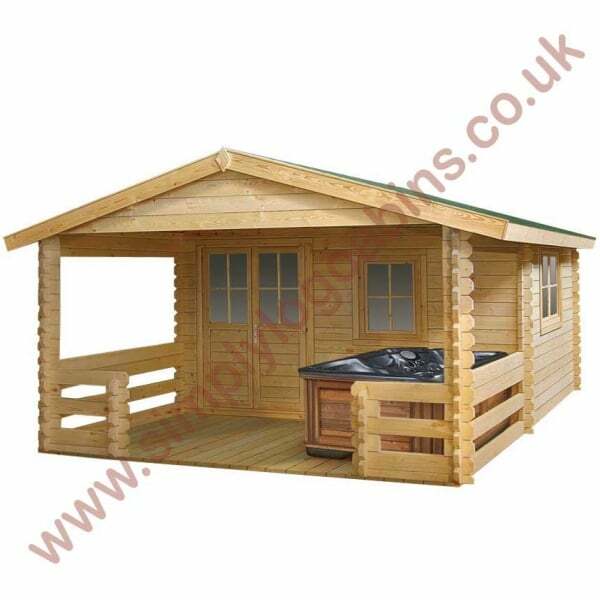 Eurovudas Steamer Log Cabin: The Eurovudas Steamer Log Cabin is designed to accommodate a hot tub beneath its large, 2.4m long front canopy. The veranda is surrounded by 26mm tongue and groove terrace boards, and covered by the 19mm roofing boards. These boards can be topped with shed felt and/or bitumen felt tile shingles for added protection against the elements. The 44mm wall logs of the cabin room are double interlocking tongue and groove, offering protection for the interior against the worst of bad weather. The interior lets in plenty of light with its windowed double doors, front window, and side window, all of which are double glazed and include double rubber gasket.